BEIRUT — It’s official according to the Vatican. Pope Benedict XVI will visit Lebanon from the 14th to the 16th September, in just five months’ time. 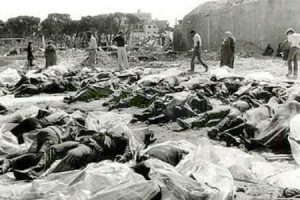 By coincidence or design, the Pontiff’s visit will coincide with the International commemoration of the 30th Anniversary of the Sabra-Shatila Massacre during which Christian militia, facilitated by nearby Israeli troops who had sealed the Palestinian refugee camp, slaughtered more than 3,000 unarmed civilians on site—approximately 25 per cent of whom were fellow Lebanese. According to British journalist Robert Fisk, and the late American journalist Janet Lee Stevens, more than 1,000 bodies were dumped by Christian militia on Saturday and Sunday September 18-19, 1982 at various sites in south and east Beirut (including the golf course on airport road) and Bkerki. These Christian militia killings, overseen by their Israeli handlers, amounted to a second massacre inside their Cite Sportiff “interrogation center.” The sports stadium is located on the western edge of Shatila Camp bordering the Drouk neighborhood, which is also known as Sabra, across from the former Gaza Palestine Red Crescent Society Hospital. Palestinian refugees in Lebanon hope that the Pope will find time to meet with them, and some of the kids in Shatila told this observer that “We can tidy up the camp and make it nice for his visit.” Yet it is a bit awkward to envisage the Pope trudging along Shatila’s sometimes barely five feet wide sewer-wet winding alleys where the sun has not shone since the original camp tents became cinder block hovels back in 1950-51. President Jimmy Carter considered such a visit and route a couple of years ago but his Shatila camp trek was vetoed by the US Embassy and the US Secret Service. Then as now, the worry was that at the juncture of some of the alleys are security forces from a variety of PLO factions and making sure all went well would be an enormous task. Still, the kids hope the Pope will come and he could indeed attend the Sabra-Shatila Massacre commemoration at Shatila’s Martyr’s burial site where more than 1,100 bodies were buried in haste as the world discovered the scope of the carnage on September 19, 1982. Many in Lebanon, including in the refugee camps, in anticipation of the Pope’s visit, are discussing Jesus from Palestine and his missionary work as well as the human rights teachings of the 5th century Syrian Christian monk, St. Maron from “Kefar-Nabo,” who devoted his life to his quest for nurturing and healing the “lost souls” of both non-Christians and Christians of his time. Hadi, a teenager from Shatila camp explained, “We have studied that in 1997, Pope John Paul II visited Lebanon to give hope to Lebanese who are downtrodden and discriminated against and who said, ‘Lebanon is more than a country, it is a message from Calvary to love thy neighbor as thyself.’ John Paul II reminded us of the divine Shepard’s plea, ‘Care for my lambs. . . . Care for my sheep’ (John 21:16-17).